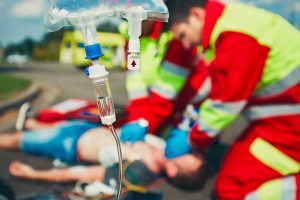 This randomised, double-blind trial included 8014 patients with out-of-hospital cardiac arrest. These patients were treated by paramedics who administered either parenteral epinephrine or placebo (saline solution). Patients also received standard care. The primary outcome was survival at 30 days, but researchers were also interested in survival rates until hospital discharge with favourable neurological outcome (defined as less than grade 3 on the Rankin scale). At 30 days, 3.2 per cent of patients in the epinephrine group, and 2.4 per cent in the placebo group had survived at 30 days. However, more patients at the time of hospital discharge had severe brain damage in the epinephrine group than in the placebo group (31.0 per cent vs. 17.8 per cent). The reasons for this is unknown. Researchers suggest that epinephrine increases blood flow to the heart, but it also reduces cerebral microvascular blood flow. They also hypothesise that the brain is simply more susceptible to ischaemia and reperfusion injury.